I first chanced upon Bridget's photos on Instagram, where she posts beautifully composed streetstyle photos of the fashion insiders during fashion weeks, and I fell in love with them. Through some interaction with her on Instagram, I came to know of her project, Downtown From Behind. 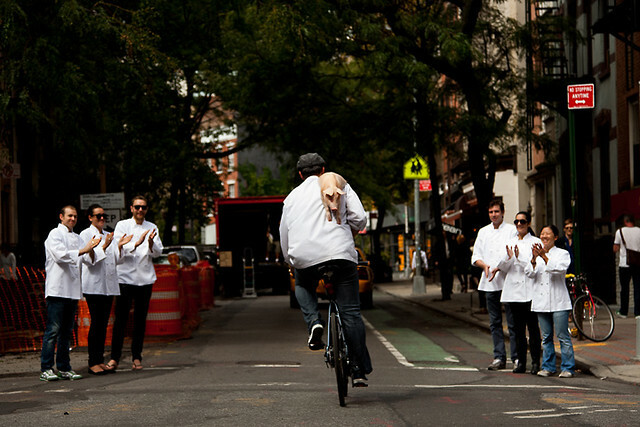 DFB aims to capture interesting people from all walks of life riding their bikes down all the streets of New York. I feel that it really reflects the many facets and layers of New York city, and also the amazing people behind the city that makes it turn. All the shots are very natural, but yet beautifully composed and lighted. 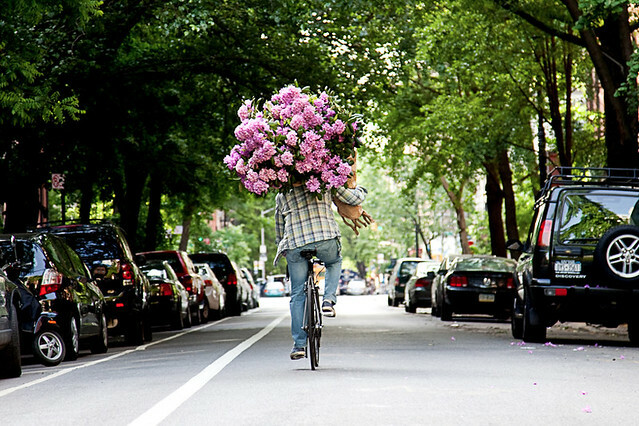 How did you come up with the idea of photographing people from behind, riding bikes? I spent my first summer in New York enthusiastically filming (video) friends as we rode between some of our favorite cafes, bar and bookshops. The original concept was to create a video project, with the same idea, shot on every street below 14th. I shot the first still image on Broadway, and fell in love with the mood, it grew from there. What do you look for when you shoot a subject? Each subject shot has had an impact on New York in some capacity; socially, culturally or physically in the case of an architect as example. They represent many of the people who are helping to make New York what it is today. Do you "stage" your photographs ie contact your subjects beforehand to inform them of the shoot and then subsequently conduct the shoot? Every shot, with the exception of maybe three, has been organized. I like to meet the subject before shoot day, discuss direction, what is most authentic to them, street, styling if relevant, etc. On the day, it happens pretty naturally, and depending on the street, it can take 20 minutes or an hour. 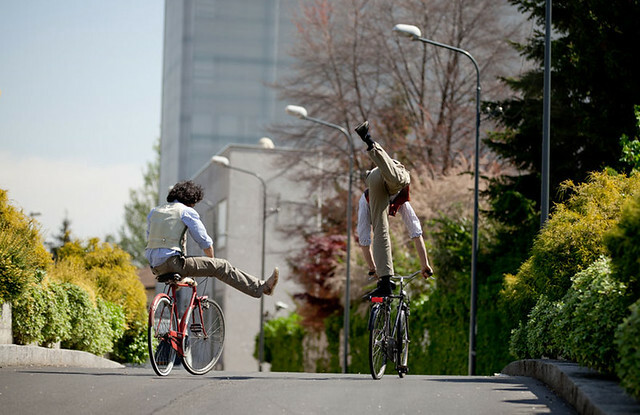 How was the process like when you first start photographing people on bikes? It's a relatively simple, no lights, one camera, just the subject and I. We're focused and having a good time! I had always had a camera in my hand for as long as I can remember. But I only pursued it professionally, as a career, in the last five years. Why the move from Australia to New York? How would you compare the two countries/cities? I love Australia, the lifestyle, landscape and food is beyond incredible. But to work in New York is a great experience, and offers creatives the opportunity to work alongside and with some of the most exciting tastemakers in the world. It's a dynamic and demanding city, and one that encourages you to do well, and propels you forward. What makes a good fashion image or portrait, in your opinion? A good image should have a narrative, a reason why, and should tell a story. What other side projects do you have currently/completed in the past besides DFB? Downtownfrombehind has been my primary focus in the last 24 months. My next major personal project is called 'Consumer and Brand'. This project explores the relationship between a consumer and iconic an brand/s. It straddles commercial and fine art photography, the first images from this series will be published later this summer. Photos that contain life stories of different individuals, through just a casual gesture and setting. I particularly like the chief with a pig on his shoulder.